My goal for this year was to travel less often, but it seems like I can never follow my own advice. By working online as a digital nomad and having the freedom and flexibility to travel anywhere, it's often easy to say yes to things that sound amazing and why not to everything else. So even though my original plan was to spend 6 months in Chiang Mai, Thailand, 5 months somewhere in Europe this summer, then 1 month back in the USA, now that I've actually booked all of my flights and trips, I find myself again hoping place to place with adventures lined up and a ton of places to visit and things to do. Part of the reason for the madness comes from wanting to attend all of the cool digital nomad events around the world to meet up with friends, network and honestly just because they're usually a ton of fun. 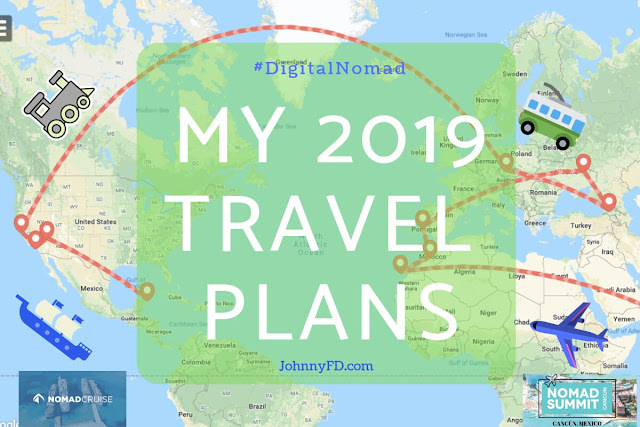 So here it is, my 2019-2020 travel schedule which consists of flying from Chiang Mai Thailand to Kuala Lumpur for two weeks, then go Colombo, Sri-Lanka for 3 weeks, then Gran Canaria, Spain to board the Nomad Cruise which takes me through Casablanca, Morocco and ends in Lisbon, Portugal. But that's just the start, afterwards I'll be heading to Eastern Europe to Kharkiv, Ukraine, then the country of Georgia, all before heading back to the USA to visit friends in Los Angeles, Las Vegas, family in San Francisco, then down to Cancun, Mexico, Playa Del Carmen all before coming back to Chiang Mai, Thailand. Wheww! If that sounds like a lot, it is, but trust me, there's method in my madness and in this post i'm going to break down month by month why I'm going to each place and for how long. I've been in Chiang Mai since September 2018 with some side trips down to the islands and a visa run to Bali and another to the Maldives. The goal was to stay here for 6 months this year to home base, relax, get back in shape as well as host the 2019 Nomad Summit. It all went successfully but my time has now come to an end for two reasons. First, Thailand has been cracking down lately on people who stay for longer than 6 months a year on tourist visas. Anyone who is less doesn't need to worry, but for those wanting to stay longer, you'll need to get a more complicated annual visa instead such as n ED Visa or an Elite Visa. So even though I was originally planning to get a 30 day extension and stay for another month in Thailand down on the islands somewhere either on Koh Phangan or Koh Lanta, I didn't want to push my luck and decided to instead leave the country. The timing came perfectly as Chiang Mai burning season has started early this year and is the air is already starting to get smokey, so I'm happy that I have a flight booked for the morning of February 18th to go to KL. My original plan was to fly directly from Chiang Mai to Sri Lanka, with just a short layover in Bangkok, but instead, I'm actually taking a 2 week side trip to Malaysia first. If you've been following my blog for the past few months, you'll know that I met "the German girl" back in November just before the lantern festival Loi Krathong. We've kept in touch since and met up a few times in Bangkok, then again down on the islands. She's on a round the world backpacking trip for a year and doesn't want to get into a relationship, and since we're in such different places in our lives, both geographically and life plan wise, it makes sense not to date. But at the same time we really enjoy each other's company and have an amazing time when we're together. So because the timing just happens to work out perfectly, we'll be meeting up in Kuala Lumpur for a week in between our trips. She's in Bali now and will be going to Vietnam after, and I'll be headed to Sri Lanka. The reason we chose KL is because it's the airline hub for Air Asia which means there are cheap, direct flights for both of us both to and from the city. Plus KL has really nice, cheap Airbnb rooms in resort style sky rises and fantastic food. So even though there isn't much to actually do in the city or see tourist wise, we just wanted a comfortable place to watch movies, go to the pool, gym, nice places to eat, and relax for a week before moving on. So even though Malaysian Borneo would have been 1,000x more exciting of a place to travel to, I think a week in KL will be perfect for what we both want. 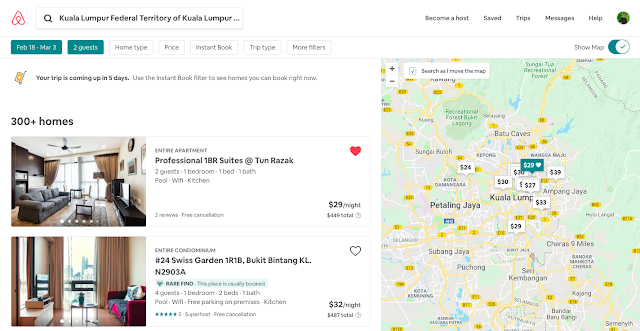 Plus at only $30 a night for a luxury Airbnb with rooftop infinity pools, gyms, and other great common spaces, KL might be one of the best value's in the world when it comes to finding a nice place to stay in the city center. If you somehow ever used them yet, here's $30 off your first stay on Airbnb. My plan is to stay there for a week with L, then hang out for a few more days after she leaves to check out some coworking spaces in Kuala Lumpur and see the digital nomad scene while i'm there. My dates in KL are from February 18th - March 3rd, 2019. From Kuala Lumpur, my original plan was to fly directly to Gran Canaria where my buddy David Vu has a spare room for me in his 3 bedroom beachside apartment and where I have to be next month anyways to start the Nomad Cruise. However, turns out, there aren't that many easy flights from KL to LPA and unless I wanted to have 3+ stops on my way there the only decent flight would be been KUL to LPA stopping at Amsterdam for 7 hours on KLM for $1,019. Also I calculated that if I go to Gran Canaria now, i'd be in Europe's Schengen Zone for a minimum of 6 weeks just going there and being on the cruise. As Americans we only get 90 days every 180 days which means I would have used up more than half of my allotted time in Europe this summer. 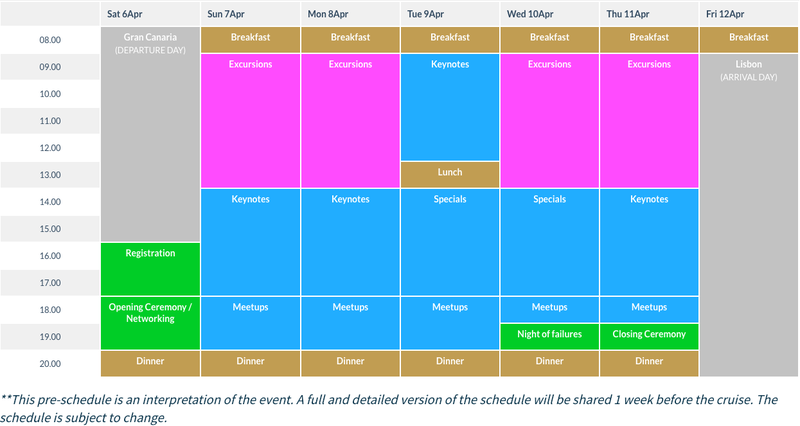 The plan is to in Sri Lanka from March 3rd-23rd, 2019 if anyone's around. So instead, I figured, why not take a $99 flight from KUL to Colombo, Sri Lanka and check out a new country, and do a bit of sight seeing for a few weeks before I go. It's kind of on the way, or at least not back tracking, and the flights from there to Gran Canaria are similarly just as bad. I would have also went first to Greece or Eastern Europe somewhere, but it's still too cold there in March. My plan in Sri Lanka is to start in Colombo, then base myself at one of the surf towns such as Dikwella, Mirissa or Unawatuna for most of the 3 weeks while doing a few safari's on the side to see wild elephants, big lizards and hopefully a Leopard in the wild at Yala National Park and Udawalawe National Park. Lonely Planet named Sri Lanka as the top country in the world to visit in 2019 so why not check it out before it gets touristy and becomes the new Bali. If you have any other suggestions on where to go and things to do in Sri Lanka, let me know in the comments. The little island of Gran Canaria is actually really cheap and easy to get to once you're in Europe as a lot of low cost carriers fly there from London, Spain, and Germany. However, from everywhere else, especially Asia and in my case, KL or Colombo, there aren't any direct flights or even many 1 stopover flights. Initially, I was highly considering taking the cheapest option of flying on a 4 leg journey which would have taken 40+ hours with 3+ layovers, but would have only been $313 which is super cheap. However, after looking into it more, I realized how exhausting that would be and since it's still winter in Europe, it wouldn't be nice to spread it out with a few short stopovers either. So I ended up finding a flight on Swiss/Edelweiss Air for around $1,000 but had just one layover in Zurich, the only issue was that it would be a 12.5 hour flight followed by an overnight layover then another 4.5 hour flight. Luckily, for "just" $750 more there was an option to upgrade to Business Class which is normally 4x the price of economy. So even though it's not overnight, I figure it'll still be both it to sit in a super comfortable chair for 12 and a half hours, watch a few movies on a bigger screen, eat better food, and lay flat for a nice 2 hour nap to break it up. Spend a few hours in the business class lounge, pay $40 to sleep in the airport overnight, then have the center seat blocked off on the 4.5 hour flight to Gran Canaria. The only issue is that even though even though I booked through Swiss Air, the flight is by Edelweiss Air which has the worst website ever made and there's no way to check in online or choose a seat. Either way it'll be good to hang out for a week in Las Palmas, Gran Canaria as it's a really cool digital nomad hotspot and my buddy David Vu is now living there. I don't really mind the long and expensive journey there from Asia. The reason I needed to get to Gran Canaria is to board the upcoming Nomad Cruise on April 6th, which will be a ton of fun and because I'll be giving a talk on aboard the ship. I went on the cruise last year and really enjoyed it and made a ton of great friends. If it wasn't for commiting to the cruise, I would have stayed longer in Sri Lanka, skipped GC all together and flew directly from Colombo to Kiev which is surprisingly an option on Ukraine Air. I almost didn't want to go this year as it's a bit of a short cruise at only 7 days compared to their longer cruises. But when I thought about it a bit more, it's short compared to the 14 day transatlantic cruises they normally have, especially since 10 of those days are at sea which gives you a ton of time for workshops, hanging out and networking. However the shorter cruise is more about doing excursions everyday with 1 or 2 talks or workshops in the afternoons instead of full day ones like we're used to. It's also good for people who want or need to work each day as after breakfast, you can either work from your SIM card as you'll be within range of land, or get off the ship and find a coffee shop near port each day. For me Tenerife, Casablanca, and Lanzarote will be new places I haven't been to yet which will be exciting for me to check out. But since I've already been to Cadiz, Gran Canaria and Lisbon, I'll still do some exploring, but it'll be time to cowork and chill out most likely. Either way, it'll be fun to hang out with the Nomad Cruisers and give a keynote talk while i'm on the ship. If you want to join, you can use coupon code "NOMADSUMMIT" to get €50 off any Nomad Cruise cabin. They start at €950 if you book a shared room, and they'll even match you up with a roommate of similar age and gender. I really enjoyed my time in Lisbon a few years ago when I first went. It's a fast growing digital nomad hub and is somewhere I'd seriously consider living long term if I wanted to be in Europe. The winters are mild, it has beautiful beaches, great food, wine, and is just overall a really nice country. Lisbon itself is getting a bit overpriced, but there are still spots like Porto or the Algarve that have places to buy or rent long term. I wrote all about what I did in my Lisbon for Digital Nomads blog post. This time around though I have no plans. I'll leave it open ended as chances are I'll meet some new friends on the ship and want to hang out and travel along with them. At most i'll book a room in Lisbon for the day we arrive for a few nights then plan on hanging out for 1-3 weeks with them afterwards. So the dates would be somewhere from April 12th-April 30th or so, which is a nice time to be in Portugal as the weather starts getting warmer by then with sunny days at 20c/68f which isn't too bad for Europe in the Spring. I've been to a lot of places in the world and have made a ton of travel videos but my Life in Lisbon video below is still my favorite. I had such a good time hanging out there, partially because of the people I was with but also just because it's a really fun, beautiful city with a ton to do. Take a look at it below and come join me in Lisbon if you're around! After Lisbon, the plan is to fly as direct to Kharkiv as possible starting at or around May 1st, 2019. The weather goes up from a freezing low of 5c/41f to a more manageable nighttime temperature of 10c/50f starting in May with day time temperatures at 21c/70f which are fine. The good news is there are flights from all over Portugal so whether we end up down in Faro or up in Porto i'll be okay, but either way i'll probably have to spent a day in Poland somewhere on a layover as those are the only flights. The other option would be for me to fly to Kiev first then take a train, but either way, thanks to low cost European airlines such as Wizz Air, there are plenty of cheap options. 1. I want to learn Russian and since it's near the border, it's a great place to practice since it's the primary language there and very few people speak English. 2. The Ukrainian Dollar (UAH) is still undervalued so things are essentially 75% cheaper than they would normally be. 3. It's not in the EU or Schengen Zone so it allows me to stay in Europe for the entire summer, a total of 6 months instead of just 3. The reason why I chose Kharkiv in particular this trip is because it's the next biggest city in Ukraine that I haven't been to yet. I still recomend Lviv, Ukraine as the best city to visit if it's your first time or just have a week or less to visit. The capital of Kiev is good for restaurants and nightclubs but is also a bit of a soulless city as it feels like no one really wants to be there. On the other hand Odessa, Ukraine is great to visit as it has both a cool city center and a beach with a much better vibe as people are generally happier there. But this trip i'll be going to Kharkiv as it's closest to Russia and I want to immerse myself in a city where Russian is the primary language so I can get fluent enough to travel to other former USSR states like Georgia and be able to communicate. The video below is from my time in Lviv, Ukraine and a great high light of why I loved it so much. I don't actually know anything about Georgia, how I would get there from Kharkiv or where in Georgia I would visit, but it's one of those bucket list countries I really want to visit. Everything I've heard about it has been incredible and it's not well traveled yet which means it's a bit fun to pioneer. The language barrier is still large, but with everyone over 35 speaking Russian and people under 25 generally speaking a bit of English, it might be a fun place to practice my new language skills. Georgian food for anyone who hasn't had it is incredible, as is the wine. I've heard the locals are some of the friendliest in the world, and it's just one of those exotic countries that are so off the beaten path it fascinates me. I don't know exactly when or if I'll even go to Georgia this summer as it depends on how settled I get in Kharkiv and how much I like it. But there's a big chance i'll either end up there or somewhere else like Latvia or Belarus this summer sometime in July or August to hang out with Sam Marks on our yearly adventure trip. Sometime around the middle of August the plan is to slowly make my way back into the Schengen zone and explore a bit of the Czech Republic and maybe their sister country, Slovakia while i'm there. I've been to Prague and loved it, but would really like to see more than just the captial city. From September 5-7, 2019 I'll be attending and speaking at the Dropship Lifestyle Prague retreat which is an annual private event for members of Anton's dropshipping course which is the course I took to learn how to make money online dropshipping physical products. Every year I try to attend his retreat as it's a fun way to catch up with everyone, but it's also really inspiring as 95% of people who are successful with ecommerce aren't posting about it online as they're busy living their own lives and running their business. It's also nice to get them on the podcast to share their stories as their success is often super inspirational to others. At last year's retreat in Bali, I interviewed Carla the mother of 3 on episode 209 of Travel Like a Boss Podcast and also Armit the Indian truck driver on episode 210 who are both crushing it with their stores but never talk about it online as they don't have a blog, youtube channel, reddit account, or spend time in facebook groups and forums all day. I can't believe it's already been 4 years, but video below was one I made during my first trip to Europe including Prague, back in the day when the standard Youtube video needed to be around 2-3 minutes or less as people's attention spans weren't yet used to long form content on youtube. Funny how much things have changed since then. I know it seems strange to jump straight from Prague to Vegas, the two playgrounds for adults in the world, but that's the plan as summer will be coming to an end anyways by September and I'd like to go home for at least a few weeks to see friends, family and catch up on things like renewing my passport and getting a new Thai visa for next year. So my actual plan will be something like flying to San Francisco on September 10th, spending a week there with family, going down to Los Angeles to hang out with friends and to visit the Thai consulate there, then going to Vegas from there to host the first ever Invest Like a Boss Summit conference for investing and personal finance from September 28th-29th, 2019. Hosting the conference there will be a fun excuse to go to Vegas and write it off as a business expense, so if anyone's interested in investing or if you're a listener to the Invest Like a Boss Podcast, come hang out! 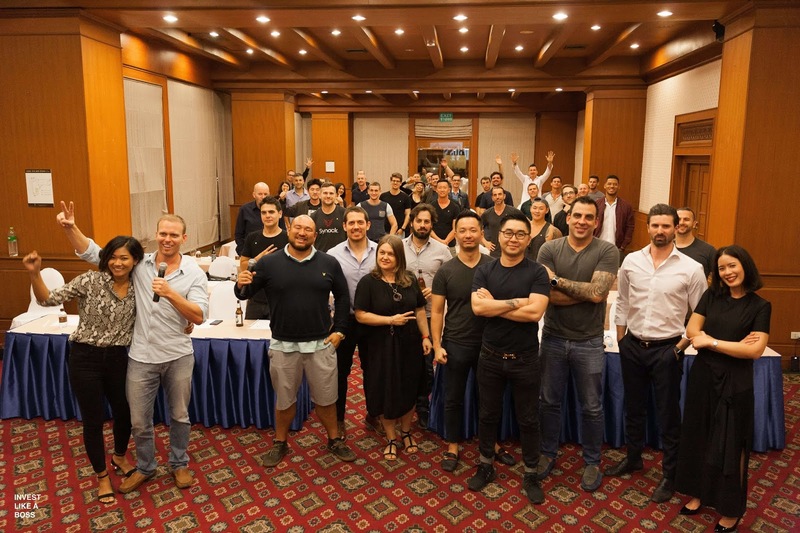 The idea came to us to host the event live during Episode 115 of Invest Like a Boss while we were talking about how great our Chiang Mai, Thailand meetup was and how cool it would be to have an annual meetup or event somewhere in the world. Another crazy idea for this year was to move the Las Vegas Nomad Summit to somewhere more digital nomad friendly and less expensive such as Mexico. It's still an easy flight for most people in North America and surprisingly even certain parts of Europe. The hotel rooms will be a 1/3 of the price of the ones in Vegas once you include things like resort fees, and since Playa Del Carmen is quickly becoming a new digital nomad hotspot, we wanted an excuse for everyone to go check it out. The reason why chose Cancun instead of Playa is because it's where the airport and conference center is. We'll all be heading down to Playa Del Carmen the week after to cowork, scuba dive and hang out down there for a few weeks or longer, but I'm glad to have partnered up with Selina Coworking and the Tech and Innovation board of Mexico to to host the Nomad Summit Cancun event October 11th-14th, 2019. I think it'll be a fun excuse for all of the digital nomads who have always wanted to visit Mexico or Central America. My plan is to fly directly from Las Vegas to Cancun on October 1st and stay there for two weeks to relax and prepare for the event then to stay in Playa Del Carmen for a month after to check out the coworking and living scene there as I really want to like Mexico as a new nomad hotspot since the time zone is much better for Americans, it's closer to home, and has easy flights to Europe. 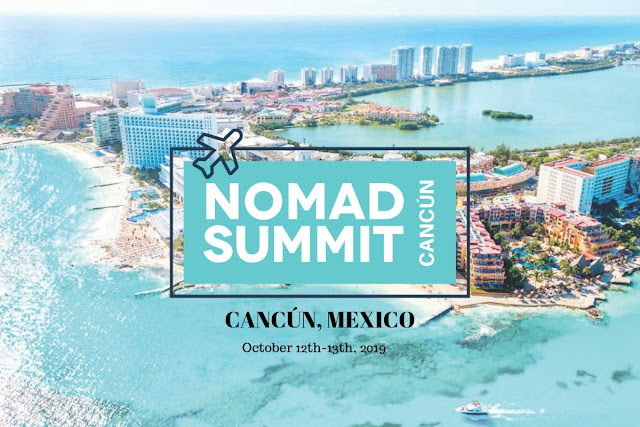 The first ever Nomad Summit in Mexico! Even though it's flying halfway across the world, Chiang Mai during winter is such an amazing place that I don't want to miss it. So the plan is to be back in Thailand sometime in November, 2019 to spend 3 months there to catch up with friends, hang out and get ready for the Nomad Summit 2020. It isn't officially announced yet as we're first working on the Cancun event, and haven't started planning the Chiang Mai one yet, but will most likely be the end of January in Chiang Mai for our annual mega event or somewhere around those dates. To get updates as soon as the event is announced, sign up for the email list at NomadSummit.com where we'll announce discounted presale tickets and more info once the event is set. The nice thing for me is that since i'll only be in Thailand for 3 months next year, I can just get a single entry Tourist visa which is cheaper than the 6 Month METV and won't require me to make any visa runs. I don't know where I'll be after February, 2020 as that's a long time away to plan, but tentatively I thinking about taking everyone back down to the Thai islands again after the conference, then heading to Raja Ampat, Indonesia to scuba dive on another liveaboard trip. But we'll see what happens as it's so far away. My 2019 Travel Plans made with Trip Happy. Above is a map of my travel plans for the rest of 2019. I know my original plan was to move around less, travel less often and more slowly, but the hardship of being a digital nomad is the amount of freedom and opportunity that comes our way. It's hard to say no to things like hanging out with friends in new countries, going to cool events, and exploring new places when you have the option to do so. The hard part of working online and making enough money to travel non-stop is the temptation to do exactly that, but then either get burnt out along the way or completely neglect our health, business growth or relationships while doing so. With that in mind, even though it seems like my travel plans are insane this year yet again moving through 11+ different countries, the plan this year is also to make it as low stress as possible and really take my time whenever possible. That means traveling with carry on only luggage, and staying longer in places to be able to get into a healthy routine. We'll see what actually happens though. So that answers my "Where to next" now it's your turn. 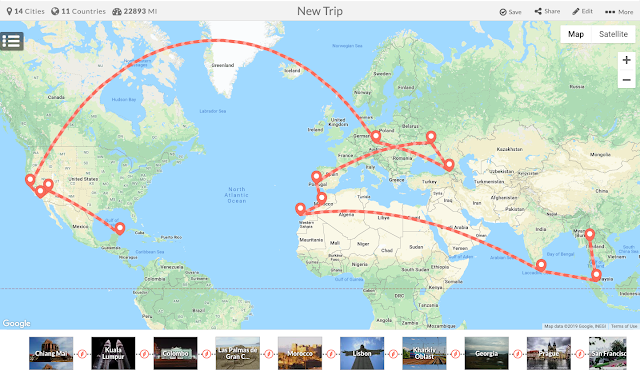 What are your travel plans for 2019? Leave your answer and any questions in the comments below! Where is everyone traveling to in 2019? Leave a comment here. Oh shoot; starting burning early, eh Johnny? Oh well...we know it's the deal when doing sits this time of year. We arrive to Chiang Mai in mid March for a house sit. It will still be fun albeit a bit smoky LOL. In Turkey now for a month and we wrapped up a 2 month sit in Oman last week. Happy Travels! Funny, I'm in Tbilisi right now. It's a pretty sleepy town right now in the off season, I'm told it gets much more lively during the summer. Reason why we came here (me n gf) is that we were locked out of Schengen after 3 months there, and we stayed a month in Istanbul/Cappadocia, and from there the one country that was visa-free friendly (for Thai people), was Georgia. And here we are. It's a bit of a worn down infrastructure, but food is excellent, wine is even better. Hey Rio, oh wow I can imagine Tbilisi being a bit slow now as it's like 1c/34f there right now. But I heard about their easy Visas so I understand. Enjoy some of the food and wine for me while you're there! Hi Johnny, sounds like you'd be better off learning Spanish than Russian. A couple questions: 1) If you were 50, which Thai visa would you get? 2) What's your luggage situation now? Sounds like you're not traveling anymore with your big roller bag. Is that short term or the new normal? Best of luck in 2019! Hey Paul, I know Spanish is more useful but South America/Spain/etc doesn't excite me as much as traveling to places like Kazakhstan or Georgia for whatever reasons which is why I'd rather learn Russian. For Thai Visas, if you want to stay in Thailand 8+ months of the year, I'd get the retirement visa. But for me I'd rather get the 6 month METV and travel more. You managed to get 'launch velocity' based out of CM and can now be anywhere in the world. I hope to be up-to-speed for any JV dropship stores in October forward, if you run that again. Hope to see you next year if we do the partnership again! Cool, I'll be fluent in A-Z dropship by then, and already in CM long-term. Will keep reading through your posts from 2014. Lots of little nuggets all over the blog...also found a great post over on Sebastian the German dude's blog (your previous DS partner maybe) regarding one area I had questions on. Hey awesome. And yes, there are a ton of tips and nuggets in my blog from 2013-2016 when I was talking a lot about my store building process. Also in my progress thread inside the member's area of http://AntonMethod.com as it was my store building diary there. Awesome travel plans. We arrived in Colombo today. Going to travel around Sri Lanka for the next two weeks. I can give you some tips in a week or two. Awesome, hope you like it there, let me know your favorite and least favorite spots!